I am very excited...my CSA starts today. That means that every Monday morning for the rest of the summer I will be picking up fresh organic produce from a local farmer. I am really looking forward to the nutritious surprises coming my way every week and trying lots of yummy new recipes. Here is a refreshing summer salad for you to try! 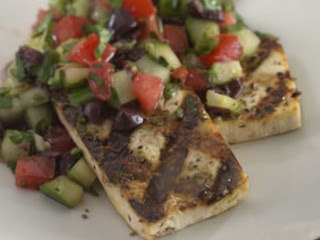 A summer staple, this flavorful salad is good on it's own or with grilled fish or chicken. Like all fresh tomato salads, it provides some fiber and a healthy dose of vitamin C.
I think this salad better with lunch and dinner.